Born Konstantinos Gavras (shortened to Costa-Gavras) in Greece during 1933 and living there throughout WW II. As his father was a member of the Communist Party he couldn't get admission to a Greek university, so he went to France to first study law, then switched to film. Most of his films are in French, but he made a few English ones ; also made comedies and crime stories, but Costa-Gavras is noted for making political movies. When I say political I really mean how power is exercised and his political movies refer to abuse of power. Many of these movies portray a background of non interest or acceptance amongst the public. Abusers attain power and maintain it with deception and violence. Some political movies are about political campaigns. Costa-Gavras directed and and wrote scripts for most of the described movies. He also produced a number of movies. 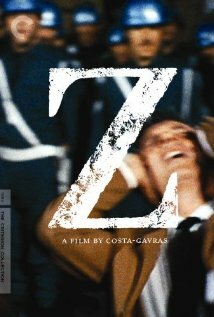 "Z" released in 1969 was his first and set in Greece. A line from this movie during screen credits seems appropriate for many of the others- "Any resemblance to actual events, to persons living or dead, is not the result of chance. It is deliberate." The plot concerns an assassination of opposition leader by secret police and covered up until a prosecutor bravely dug a little deeper. Yves Montand was the leading character with important roles played by Irene Pappas and Jean-Louis Trintignant. Filmed in Algeria as they were able to find locations similar to Greece. Shortly after the events of this film Greece was governed by the military. Won the Oscar for best foreign film and also the jury prize at Cannes. Music by Miklos Theodorakis who apparently was in exile at the time and had the orchestration done by another musician. "The Confession" (1970) was set in Czecholslovia. It depicted mock Communist trials that were about political infighting. Yves Montand and Simone Signoret were principal players. "State of Siege" was released in 1972, this time with Yves Montand- playing the bad guy, an American torture expert who was kidnapped. It was set in Uruguay and depicted some urban guerrillas fighting a corrupt military establishment. Ironically it was filmed in Chile that underwent a major coup shortly afterwards. Music was again by Miklis Theodorkis. With two intervening films (that look interesting but not seen) "Missing" was released in 1982 with Jack Lemmon and Sissy Spacek in English. Filmed in Mexico, but set during the Chilean coup. Jack Lemmon plays a middle class American business man who at first is embarrassed by his son's journalistic job but then gradually realizes his government is complicit in the coup. Music by Vangelis that I bought from iTunes. Won an Oscar for script writing from another source and also won the Palme d'Or at Cannes. "Music Box" was released in 1989 with an English cast headed by Jessica Lange. Filmed in Chicago and Hungary it was concerned about Holocaust perpetrators with layers of deception involving different governments with some trying to uncover the truth and others trying to smear reputations. 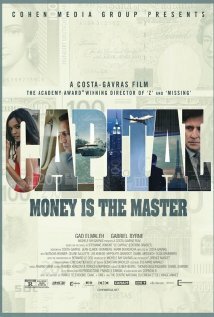 The latest one I watched was "Capital" which came out in 2012. It was filmed in London, Paris, Miami and New York, all locations as part of the story. Its focus was dirty business manoeuvres which were hard to keep track of. Gad Elmaleh, better known for comedies played the lead role. I enjoyed him in "The Valet" and "Precious" and was surprised to learn he was born and raised in Morocco and spent several years in Montreal studying political science. Costa-Gavras liked dramatizing political abuses. There are documentaries about similar events, but he felt a fictional movie would have more impact if it could be made entertaining. He was one of the masters and possibly not finished yet.